It took some people longer than others Monday afternoon to recognize a widely familiar face in the local library. 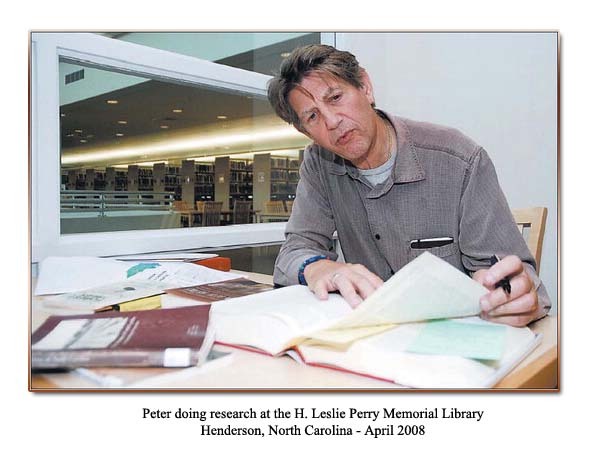 Peter Coyote was the man with graying hair and a gold earring, the man who climbed the winding stairs inside the H. Leslie Perry Memorial Library to do research in the Local History Room. Coyote is working on a nonfiction book featuring Susie Nelson, an 80-year-old Henderson resident, as one of its main characters. Coyote, of Jewish descent, said the African- American Henderson native "raised me from the time I was 3 until I was 13. For all practical purposes, she was my mother." Before coming to the library at Chestnut and Breckenridge streets, Coyote had already spent several days interviewing Nelson in her brick home on Center Street. It's in the small community known to some as Mobile, just outside Henderson's city limits. Early Sunday afternoon, Coyote went to The Silo restaurant for brunch with Nelson and her nieces and nephews. "Susie introduces me to people as her son," he said. "She has a great son named Bill Nelson. I'm another one." The author, who is 66, said Susie Nelson was 17 when she left her home in Vance County and moved to New Jersey. After briefly doing parttime housework for Coyote's aunt in Paterson, N.J., Nelson came to Englewood in the spring of 1945 to help his family full-time while his mother was ill. Coyote's mother did recover, but Nelson was in the boy's life for a decade. Coyote was 3 1/2 when he met Nelson. "In short order, she just ran the place," he recalled. "My parents (Ruth and Morris Cohon) were unusual people who had no racism in their home, and it became Susie's house." Coyote said he and his younger sister, Elizabeth, were very attached to Susie "because she did everything for us. When she said 'jump,' we jumped." Susie had lots of friends who often dropped by, according to Coyote. "I grew up listening to black people talking about white people, and white people talking about black people," he said. Nelson and her husband, Ozzie, held their wedding at the Cohon house, and lived with the family for a year thereafter. When he became an adult, "I felt I was half black and half white inside," Coyote said. He described trying to reconcile his two sides at a time "when other blacks and whites weren't getting along out in the world." It wasn't until he was in his 40s that both parts of Coyote were able to peacefully coexist. He is writing a book about himself and his stepmother "in this moment when Barack Obama is running for president. The whole issue of race is wide-open right now." Obama was born to a white mother and a black father, Coyote noted. "People are trying to determine if he is too black or not black enough." Coyote accused the media of "stirring up controversy" about remarks made by Obama's pastor, Rev. Jeremiah Wright. "He is the smartest man I ever heard speak on TV," Coyote said of Wright. "So I thought it would be a good time to write this story. I started about a month ago." • "If You Think There Is A War On Drugs, You Don't Understand The Situation." • "If You Think We Love Our Children As A Culture, You Don't Know The Facts." • "If You Think Your Government Is There To Serve You, You've Got It Wrong." His book is intended to show "how things really work." 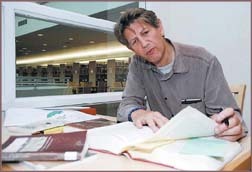 He wasn't able to get as much research done in the library as he wanted to, Coyote said, because it didn't open until noon on Monday. "You don't have enough funds to keep the library operating all day," he noted. His self-imposed mission was to gather information on North Carolina, such as its geology, plants and trees. One of the sources on Vance County that he examined was "Zeb's Black Baby." Coyote, who lives in Marin County in California, was on his way before 2 p.m. on Monday to perform with the Greensboro Symphony. The guest conductor was his friend, Dimitri Sitkovetsky, a well-known violinist and conductor in London. Interviewed by phone while he was on the road, Coyote was asked what he thought of Henderson. "It's a lovely town that has fallen on hard times," he said. When tobacco and cotton faded away, people didn't expect factory jobs to go to Indonesia, Coyote added. "Henderson feels like a real nice place that is struggling to stay above rising water." Nelson was contacted after Coyote left Vance. "What you saw is exactly the way he's been since he was a kid," she said of the man whose words are rarely minced. "He has never changed." While the demeanor of her second "son" is very direct, Nelson conceded, "He is a very gentle man and is very fair. I raised him that way."